This page provides you with all the necessary information you need to know to make an informed choice about carpenters insurance. Furthermore, we can connect you with an experienced insurance broker that can find you the best rate across numerous insurers. 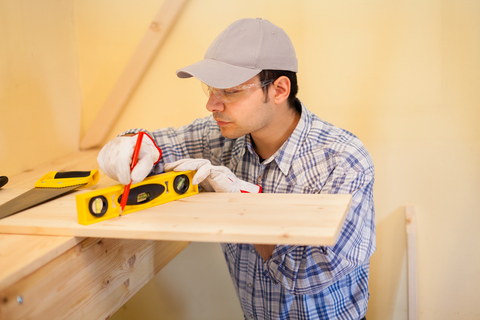 What insurance protection do you need as a carpenter? As a carpenter you typically specialize in cutting, shaping and placing building materials (often wood) and you are involved in all construction phases for various objects, buildings, means of transportation, and more. Insurance that covers risk of liabilities resulting from various claims such as bodily injuries, personal injuries, property damages that are caused by business operations, products, services or take place on the business premises. Yes You need this one as a carpenter to make sure that you are covered if, for example, your customer got hurt through any of your tools such as an unsecured saw or a nail gun. Insurance that covers any type of commercial property from a number of risks such as theft, fire and natural disasters. Yes You need this one if you have any type of expensive equipment such as circular saw, nail gun, jigsaw, various types of sanders, electric drill and many others. Insurance that covers business use of cars, trucks, vans and any other means of transportation. This policy can include coverage of vehicles (e.g. damages), drivers (e.g. medical costs, rehab, loss of income, funeral expenses), liability (e.g. damages to the third-party), uninsured motorist protection, comprehensive coverage (e.g. theft, fire etc.) and number of other protections. Sometimes If you, as a carpenter, have a vehicle to drive to your customers and transport your tools, you will require commercial car insurance. Combination of the following types of insurance that you can offer to your employees as a part of the compensation / benefits package: life insurance, health insurance / health benefits, critical illness insurance, disability insurance, drug plans etc. Sometimes In order to attract the best talent, you want to consider offering group insurance packages comparable with those offered in the industry. Without that you might be loosing great candidates who could be interested in that form of benefits. Insurance that covers various types of commercial property from pre-determined risks (also called perils) such as theft, natural disasters, fire. Rarely Typically no. You do not need it unless you own a building and use it to operate your business. Must-have elements of carpenters insurance: As a carpenter you often do not need all the insurance types, but there are a few which are a must for you: commercial general insurance (also called professional liability) and commercial property insurance (to protect your tools). If you have a vehicle to drive out to your customers, add a commercial car insurance. Broker vs agent: Carpenters insurance can be purchased through insurance agents or insurance brokers. The key difference is that an insurance agent can offer products of one company only, the one he/she works for. An insurance broker works with multiple insurance providers and can compare insurance policies from multiple companies, offer you more options and, often, better rates for carpenters insurance. Costs for carpenters insurance: These costs can vary greatly, so working with an insurance professional to get the insurance that is right for you is very important. As an example, commercial general insurance can vary from $500/year to $10,000 depending on the type of your business. In similar situations with commercial car insurance – depending on location, your driving record, use of the vehicle etc. can start at as low $800/year and go up.